Halloween is one of the most universally celebrated holidays in the United States today. Each year, children pour over costume ideas, dream about the treats they'll collect and enjoy fun, fall-themed activities at school and at businesses and organizations throughout the area. But Halloween isn't easy for every child. Children with food allergies and feeding issues struggle with treats they cannot enjoy. Children with anxiety battle fears and worries connected with sometimes too-spooky events. 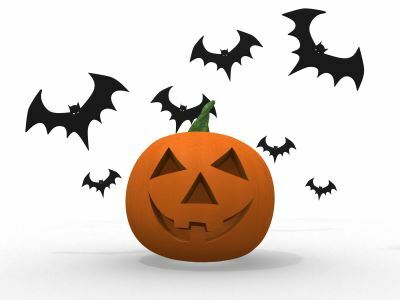 Children with social skills or communication issues may not have the ability to say "trick-or-treat!" or "thank you." Still others may struggle with finding a costume that fits with a wheelchair or mobility device. This resource guide offers tips and additional information to help our families and the surrounding communities create a more inclusive Halloween. Sensory issues affect, on average, 1 in 20 children in the United States today. Children who struggle with sensory issues have trouble processing information received through the senses. For example, a child with a sensory aversion to loud sounds may cover his ears and hide in a noisy gymnasium. Limit sensory triggers such as fog machines, strobe lights, and sound effects. Keep in mind that a child may have sensory issues with wearing a costume. Be accepting of their choices (we loved this article with tips for creating a sensory-friendly Halloween costume and an entire Pinterest board with costume ideas). Be sensitive to children experiencing sensory overload. Halloween can be overwhelming for a typical child, but a child with sensory issues may not know she's reached her limit until it's too late. With 1 in 13 children diagnosed with food allergies and many more experiencing issues with food, including diabetes, swallowing issues and oral motor challenges, traditional candy treats can cause some unintended Halloween struggles. There's an easy fix for this problem: consider offering non-food treats as an alternative to traditional Halloween candy. Whether you choose to participate in FARE's Teal Pumpkin Project or just keep a few non-food treats on the side for a child who needs them, you can make a difference in a struggling child's Halloween night. 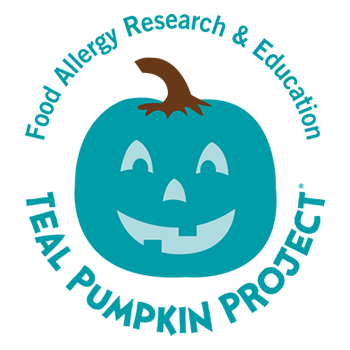 For more information on The Teal Pumpkin Project, including non-food treat ideas, click here. Save creepy decorations (especially automatically triggered mechanical decorations) and scary special effects for adult parties. Make sure the location where you hand out treats is well-lit (this helps trick-or-treaters with vision challenges too!). Keep pets inside. Not only will this help keep your pet safe, it also helps children who struggle with anxiety over animals. Avoid wearing masks or scary costumes while handing out treats. Don't try to unexpectedly scare trick-or-treaters. Be sensitive to fears and let children know that it's okay to be afraid. Keep in mind that children who are nonverbal may not be able to say "trick-or-treat" or "thank you." Do not push for verbal responses and be sensitive to children who do not give expected social feedback. Be prepared to describe treats for children with blindness or low vision issues. Make sure that you are handing out treats in a well-lit, accessible area. If your house is not accessible, consider handing out treats in a different location (for example, in the driveway or in a community common area). When addressing trick-or-treaters, make sure they can see your face and mouth as you speak. This can help children who struggle with speech and hearing issues. Better still, learn some simple Halloween signs (video). Be observant. Children with anxiety or other issues may wander from a caregiver or safe area. For more information on wandering, see our Wandering Mini-site. Find more ideas in this article from Easter Seals. Discuss real/not real and take turns making examples of silly, not real creatures. Find more in this article from One Place for Special Needs and this article from American Autism Association.